Look no further for that perfect throw on and go maxi dress! This adorable and comfortable maxi will be your new go-to for any season! 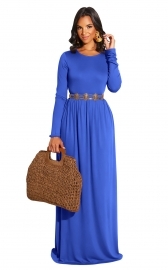 Wear it on it's own for the warm summer days or layer it up when the seasons change, you'll love this maxi instantly! Details include double neckline, short sleeves, ruched waist and fishtail on the skirt.